Very impressed with what I can do with TiddlyMap. I've posted before, probably several times, about TiddlyWiki. 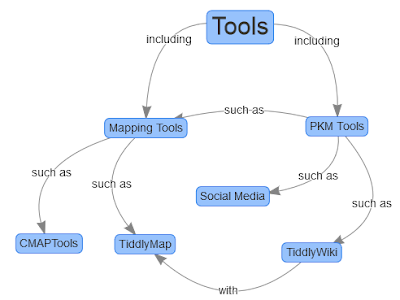 I've used TiddlyWiki extensively in the past but I've also used various concept mapping and mind mapping tools. All I needed was a tool that would combine both. It turns out that someone ( Felix Küppers, aka felixhayashi) developed a mapping plugin for TiddlyWiki. I downloaded it a couple of days ago to try out and since I've been sitting in the waiting room of the car dealership for a few hours now, there was no better time to play around with it and see what it can do. I am impressed. It's significantly different from tools I've previously used for mapping. I've used CmapTools extensively in the past as a mapping tool but I have not really used it as a concept mapping tool per se. I was putting entire sentences rather than distinct concepts in each node and not using the linking phrases. CmapTools is very flexible and can be used in ways that it wasn't intended for, and so I did. TiddlyMap doesn't have that flexibility YET since each node is attached to a tiddler, it allows me to connect a node to a great deal of information, including links, images and entire paragraphs of text if I need to. That's also possible with CmapTools but more awkward. Going back to a mapping approach that sticks to main concepts and linking phrases has been easy but that could be because of the simple types of maps I was working with for practice. I've made extensive use of the ability to link maps built with CmapTools. I've developed knowledge systems that have hundreds of maps linked and cross-referenced in every possible direction. TiddlyMap is meant for a single map. The trick is that nodes can be tagged and views created so that only nodes with a specific tag are visible. This allows me to show high level maps without all the confusing details, yet also only the details of a particular topic when I want to. In the case of the map above, I tagged all the nodes that you can see as "tools" and the map is based on a subset of nodes with that tag, yet part of a much bigger map. Technically, it's one canvas but there's nothing preventing me from developing completely separate maps on that one canvas. Each view can be a completely separate map. I also like the ability to embed a map (or specific map view) in a tiddler. The nodes and links have many styling options (nothing much is pre-populated), but as with anything TiddlyWiki-related, it's good to have a little bit of a coder's brain.